A beautiful weekend – sunny days in the 50s. The ladybugs and wasps were out again – there doesn’t seem to be any way to keep them out of the house. I spent most of the weekend cleaning seeds. I’m finished with all the big piles of prairie seeds. Now there are the smaller piles, and all the wetland seeds. I ordered the rest of the seeds we need from Prairie Moon and Oak Prairie Farm. I talked to Jim Heinrich at Oak Prairie Farm about planting methods – he likes frost seeding. He thinks it’s good for the seeds to find their own level in the ground rather than being planted all at the same level by the drill. And he likes the fact that the seeds aren’t planted in rows. He also had a good suggestion for planting the grass seeds. I’ve always wondered what to do about grasses, since they like being planted in the spring, but that means that they don’t have any frost action to work them into the ground. He suggested, at least for the more expensive grass seeds, to plant them in the very early spring, when there’s an inch or less of snow on the ground. That way they don’t have to go through the winter and lose more viability, and there’s still enough freezing and thawing, especially for small seeds like Prairie Dropseed, to get them into the ground. I think I’ll try that this year. 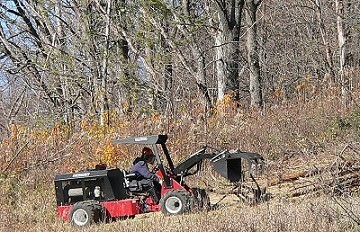 Mike spent Sunday and Monday working on the hill above Pine Point Prairie where we had the pines cut. 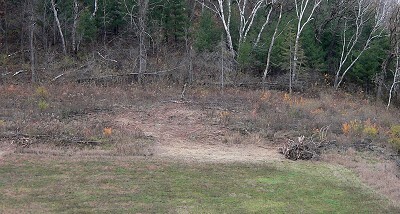 That area is such a mess, from all the slash and the pine stumps, that we’ve just been avoiding it. We were hopeful that the new machine would make it easier to clear. It’s still difficult – the stumps are high and close together, so it’s hard to get between them, and if he drives over them the powertrac gets stuck. The second day he brought the chain saw along so he could cut the stumps closer to the ground. He cuts just a few so he has a path in and out, and that makes it much easier. A few times the powertrac got so stuck that we needed to use the tractor to pull it off the stumps. And once he had a flat tire because the air nozzle stem got broken off by a stick. But he’s making progress, and we’re hopeful. Our plan is for him to make wide fire breaks along the whole area and then burn it. Still lots of work left to do!